Yep, it’s that time of year again, where pink takes over the landscape of almost everywhere you go. Pinktober is like a luxury bus driving through cities, neighborhoods, and sporting events, offering free rides for 31 days to enable people to feel good about a cause. I know, I used to be one of the riders. However, what I wasn’t aware of, is that this is one of the most successful marketing schemes of all time. 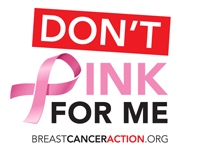 For most companies, its not about breast cancer at all….its about making money. Period. Last year I was approached by a group of people selling a product, saying that they were doing it for “Breast Cancer Awareness.” They were decked out in their pink shirts, happy to be promoting a product that was supporting a cause. I listened to their canned speech on why I needed to purchase their product, and how I would be helping the campaign to bring awareness to this disease. They all looked at me, like deer in the headlights. None of them, not one, knew why they were doing what they were doing. I proceeded to tell them that I had breast cancer and I was offended, that they were using a disease that was personal to me, to further their companies agenda and profits. I asked them if it made sense business wise to propose to support a cause of which they were not educated on. One of the girls got the message and apologized for her part, she said that she never met anyone with breast cancer and was doing it because it just seemed like the right thing to do. I gave them my business card and told them if their bosses would like to talk to me about this, to give me a call. Of course. I never heard back. This year before you jump on the pink band wagon, I would like to share just a few items that you should be aware of. 1. Does any money from this purchase go to support breast cancer programs? How much? Any company can put a pink ribbon on its products. The widely recognized pink ribbon symbol is not regulated by any agency and does not necessarily mean it effectively combats the breast cancer epidemic. Some products sport pink ribbons to try to communicate that they are “healthy” and don’t contribute to breast cancer, such as a number of natural health and beauty products. Other products have a pink ribbon in order to indicate that the company supports breast cancer programs even if the company’s contributions are not tied to the purchases of the specific product bearing the ribbon. Still other companies give a portion of an item’s cost to a breast cancer organization but may require further action on the part of the consumer for the donation to be realized. Can you tell how much money from your purchases will go to support breast cancer programs? If not, consider giving directly to the charity of your choice instead. EXAMPLE: In 2010, Dansko shoe company sold pink ribbon clogs. Consumers likely thought that a portion of their purchase of pink ribbon clogs went to a breast cancer program. However, purchase of the pink ribbon clogs was not connected to Dansko’s donation—none of the portion of the sales went toward their already set donation of $25,000 to Susan G. Komen for the Cure. No matter whether or not you bought the clogs, their donation was the same. 2. What organization will get the money? What will they do with the funds, and how do these programs turn the tide of the breast cancer epidemic? Many companies that sell pink ribbon products and donate a percentage of each sale to breast cancer programs fail to indicate which of the many different breast cancer organizations will get the money. Furthermore, the consumer is left to trust that these organizations are engaged in work that is meaningful and makes the greatest difference. If money goes to “services,” are they reaching the people who need them most? How do screening programs ensure that women can get treatment? And how do breast cancer awareness programs address the fact that we already know that breast cancer is a problem and that action is needed in order to end the epidemic? Does the money go to truly addressing the root causes of the epidemic, like social inequities that lead to women of color and poor women dying more often of breast cancer, or environmental toxins that are contributing to high rates of breast cancer? Before donating, check the recipient organization’s website to make sure that its mission and activities are in line with your personal values. If you can’t tell, or you don’t know what the organization does, reconsider your purchase. EXAMPLE: The KISSES for a Cure music box is advertised by its maker, The Bradford Exchange, online with the following: “A portion of the proceeds from this music box will be donated to help fight breast cancer.” It is not clear what breast cancer organizations would benefit, how much money they would receive, and what programs or work would be funded by the donation. 3. Is there a “cap” on the amount the company will donate? Has this maximum donation already been met? Can you tell? Some companies that indicate that a portion of the proceeds from the sale of a particular pink ribbon product will go to support breast cancer programs put an arbitrary “cap” on their maximum donation. Once the maximum amount has been met, the company may continue to sell the product with the pink ribbon without alerting customers that no additional funds will be donated to breast cancer organizations. This means you may be buying a product for which none of your purchase price will go to a breast cancer cause but only to the bottom line of the company. EXAMPLE: In 2010, Reebok marketed a line of pink ribbon emblazoned footwear and apparel at prices ranging from$50 to $100. Though it heavily promoted the fact that some of their pink ribbon product sales would be donated tothe Avon Breast Cancer Crusade, they set a limit of $750,000, regardless of how many items were sold, and therewas no mechanism in place to alert consumers once the maximum donation had been met. 4. Does this purchase put you or someone you love at risk for exposure to toxins linked to breastcancer? What is the company doing to ensure that its products are not contributing to the breastcancer epidemic? 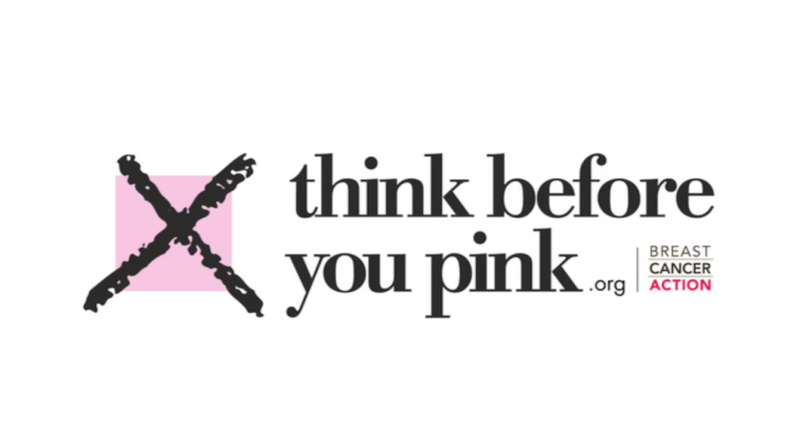 Many companies have sold pink ribbon products that are linked to increased risk of breast cancer. We believe that companies that are profiting from building a reputation based on their concern about breast cancer have a responsibilityto protect the public from possible harms when scientifi c research indicates that there is a risk or plausible reason forconcern. Some of the earliest cause-marketing companies were well-known cosmetics companies that continue to sell cosmetics containing chemicals that have been linked to breast cancer. Even car companies have gotten in on the action and sell cars that emit toxic air pollutants in the name of breast cancer. In considering a pink ribbon purchase, does the product contain toxins or otherwise increase our risk of breast cancer? EXAMPLE: In 2011, Susan G. Komen for the Cure commissioned a perfume called Promise Me that contains unlisted chemicals that are regulated as toxic and hazardous, have not been adequately evaluated for human safety, and have demonstrated negative health effects. Although Komen said they would reformulate future versions of the perfume, without official adoption of the precautionary principle, there is no guarantee that future versions would be better. So this month, if you want to support those of us with breast cancer, think before you pink and if you want to make sure your dollars are going to worthy causes that actually make a difference, here are a few of my favorites.